Myles Pinkney began his career as a freelance artist in 1986, designing logos, architectural renderings, technical drawings and illustrations for various companies and individuals. Wanting to move into creating images that reflected his own personal interests and style, he began creating and licensing his fantasy artwork in 1991. His work has been featured on a large number of products and collectibles that have been purchased and enjoyed by thousands of collectors worldwide. Some of these items are highlighted below. Portal Publications first released calendars of Myles Pinkney's artwork in 1996, and continued to publish them each year until 2007. From 2008 to 2011, calendars were produced by Sellers Publishing, Inc. Print on demand calendars were first offered in 2013 by Lowry Global Media. Franklin Mint and Westland Giftware created collectible figurines and sculptures designed by Myles Pinkney. 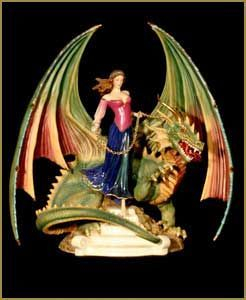 Franklin Mint released a limited edition series of four wizard, dragon and sorceress sculptures, made of hand painted porcelain and highlighted with 14 karat gold. 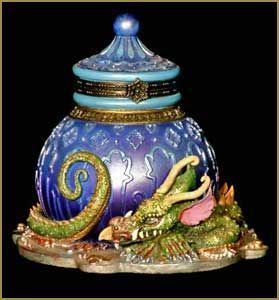 Westland Giftware produced both a set of four wizard figurines and a line of smaller dragon collectibles. A variety of collectibles designed by Myles Pinkney or featuring his artwork have been created by the Bradford Exchange and Westland Giftware. These collectibles include items such as treasure boxes, water globes, mobiles, ornaments, lamps, and others. Myles Pinkney’s artwork was first reproduced on puzzles in 1995. 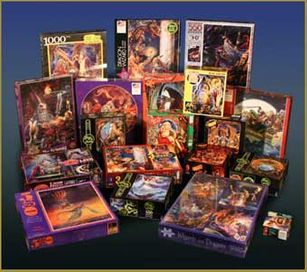 His colorful and highly detailed images are a natural fit for this popular pastime, and well known puzzle companies such as Ceaco, the Great American Puzzle Factory, MasterPieces and FX Schmid have released products featuring his artwork. 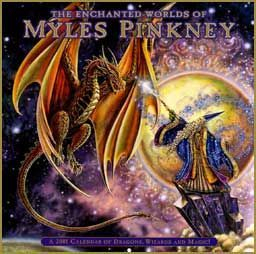 Franklin Mint released a series of 8” collector plates with Myles Pinkney’s fantasy art between 1996 and 1998. 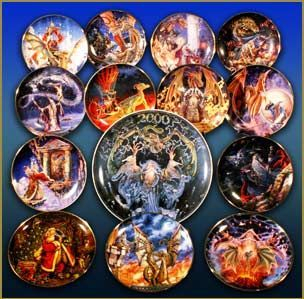 The original set of 12 plates was followed in 1999 by a 13th plate, a 12-1/2” charger featuring the painting Dragonstorm to commemorate the new millenium.